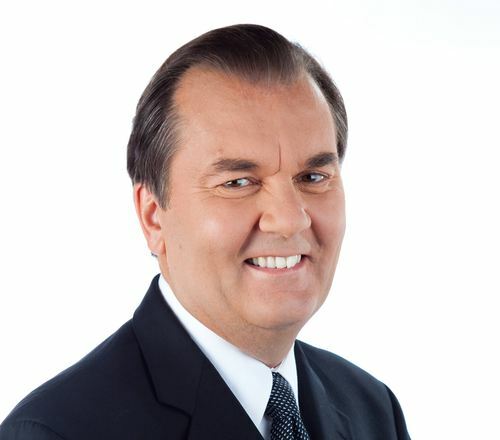 I will be sitting down later this week with Vic Rauter, long-time broadcast at TSN. He'll be dropping by to record an episode of my podcast Toronto Mike'd, and I get an entire hour to ask him anything I want. I know what questions I'll be asking him, but I'd love to know what you would ask him. What questions would you like me to ask Vic Rauter? Please share some memories of Graham Leggat during the soccer broadcasts. How will we know it's really Vic and not Don Landry ? Vic has covered so many different sports and events in his career. What would still be on his wisk list? Are there any that, looking back now, that he wishes he had not/would like to take another crack at now? Vic - Do you miss those early Sundays getting up to do the F1 pre-race show with Gerry Donaldson? If I remember, I'll get a photo with him. Like (Another) Andrew, when I think of Vic, I think of him doing those pre-race shows with Gerry Donaldson. They were great. Gerry was an unappreciated expert and Vic did a great job working with him. "Vic, what can you do to entice Elvis back for another episode of the T/O/M podcast?" And Vic's commute to the Toronto Mike'd studio is even longer than Elvis's! Can Vic do a Don Landry impression? How did his "Make the final!" phrase come into being? Vick has covered many sports at TSN. Is there anything he has not covered/broadcasted/hosted? Which sport is the most difficult to do prep work for? In his time covering sports in this country, which sport outside of the four major sports has he seen the most growth in? Which of the sports outside of the four major leagues has the most growth potential in this country? Vic, you've covered many major sporting events, but in certain circles, you'll always be remembered for your portrayal of "Freddy"... in the Earl Haig production of "My Fair Lady". Two questions: Do you still match your top hat with your spats? Do you remember the words to "On The Street Where You Live", and will you sing us a verse or two? Also from your Earl Haig days while attending Biology class, do you remember "The Uncle Gerry Show"? I'm afraid it's now too late! Hey Vic, has Russ Howard ever curled on the same team as John Morris ? I do not know why Vic Rauter keeps talking incessantly . he also keep going on about Kaitlyn Lawes. Kaiytlin does occasionally make a good throw, how ever she is the most ill mannered curler since Colleen Jones. Why Jennifer Jones keeps her on the team is a question. During the olympics it was plain to see the third she had made the team more alive. Why Vic Rauter cannot stop going on About Kaiytlin makes my stomach crawl, I have to change channels.